Below this text is a drawing of a complicated control panel, containing a large number of knobs, dials, indicator lights, and other components. A label reads: Woman. Below that control panel is another much simpler one, containing only a small indicator light that appears to be lit. A label reads: Man. The conversation continues in the next panel, in which a man is seated behind the steering wheel in an automobile, and a woman is seated at his side in the passenger's seat. Woman: ...And it shows a tiny light that goes on or off, labeled “Man.” That is so true! The dialog continues in the next panel. Voice from outside the panel: ...At its heart lies a sophisticated computer system, one that senses and decodes five hundred different signals each millisecond, and reoptimizes the engine parameters 50 times a second. Voice from outside the panel: That advanced control system was designed by brilliant engineers, all men. A complicated electronic circuit is seen, containing a variety of parts, including transistors, batteries, diodes, light-emitting diodes, resistors, rheostats, and induction coils. The next panel shows the man and woman again seated inside the automobile. 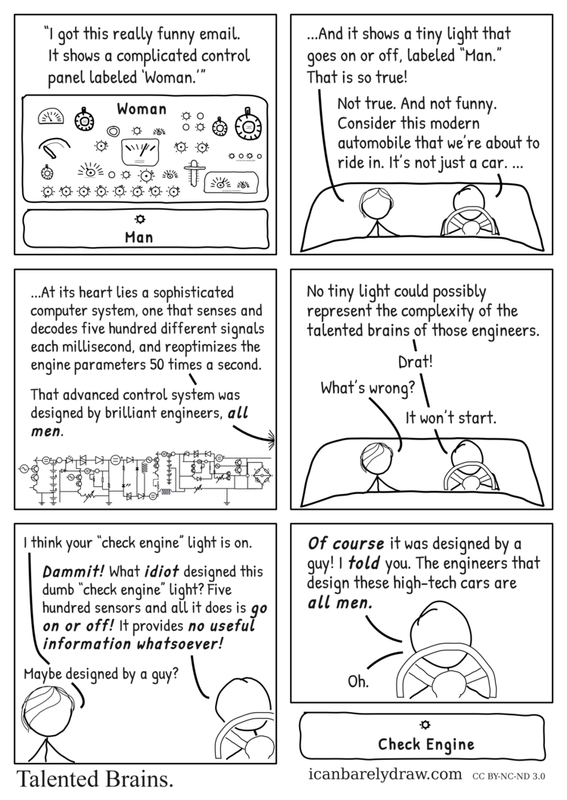 Man: No tiny light could possibly represent the complexity of the talented brains of those engineers. The woman's head is turned slightly towards the man. The man's head slightly tilted as if he is looking at something. Woman: I think your “check engine” light is on. Man: Dammit! What idiot designed this dumb “check engine” light? Five hundred sensors and all it does is go on or off! It provides no useful information whatsoever! Woman: Maybe designed by a guy? Man: Of course it was designed by a guy! I told you. The engineers that design these high-tech cars are all men. A control panel is seen, nearly identical to the one seen in the first panel, containing a small indicator light that appears to be lit. However, the label now reads: Check Engine.